We’d love your help. Let us know what’s wrong with this preview of The Art of the Steal by Christopher Mason. To ask other readers questions about The Art of the Steal, please sign up. Sotheby's and Christie's are the world's only two significant international auction houses. If you read about a painting or sculpture being auctioned off for the equivalent of the GDP of sub-Saharan Africa, it's almost 100% certain to have happened in one of their sales rooms. They've been rivals for most of their 200-plus-year histories, competing for the custom of the lavish estates and megarich collectors who need to unload (or stock up on) fine or decorative art ranging from Mesopotamian ant Sotheby's and Christie's are the world's only two significant international auction houses. If you read about a painting or sculpture being auctioned off for the equivalent of the GDP of sub-Saharan Africa, it's almost 100% certain to have happened in one of their sales rooms. They've been rivals for most of their 200-plus-year histories, competing for the custom of the lavish estates and megarich collectors who need to unload (or stock up on) fine or decorative art ranging from Mesopotamian antiquities to the latest buzzy contemporary art. Then in the last half of the 1990s, their ambitious CEOs embarked on a commission-fixing scheme that was as ill-fated as it was completely unnecessary. The Art of the Steal is the story of this ill-fated, unnecessary and ultimately meaningless escapade. Auction houses live by their commissions, the fees charged sellers and buyers (usually a percentage of the hammer [sales] price of a lot) for the various services the auction house provides. In the case of Sotheby's and Christie's, these services include expert appraisals, conservation, publicity, auction catalogs that often rival coffee-table books in their size and lavish presentation, and the auctioneers who can milk huge sums of money from the bidders. What Sotheby's DeDe Brooks and Christie's Christopher Davidge did starting in 1993 was to coordinate the sellers' and buyers' commissions so the two companies wouldn't continue the self-destructive discounting and fee-waiving that had taken such a chunk out of their bottom lines. They also tried, with less success, to cut back on the inflated guarantees (in essence, the auction house promising a seller a minimum amount of money, no matter the eventual hammer price) and no-interest, no-recourse loans (i.e. free money) promised to the biggest sellers to gain their business. Brooks and Davidge were even less successful in reining in their firms' cutthroat competition for the most lucrative customers. This lasted until 1999, when the U.S. Justice Department took an interest in what was going on; however, it had been a semi-open secret among various members of both companies' C-suites for years. The punchline: Sotheby's and Christie's were perfectly capable of coordinating their commissions without the CEOs colluding about it, as was demonstrated in 1992 and later in 2000. The entire conspiracy was a waste of everybody's time and effort. Nonetheless, author Mason takes on this tale with the seriousness usually reserved for mass murder or economic collapse, and research exhaustive enough for a Ph.D thesis. He conducted 2400 interviews and read thousands of pages of evidence and transcripts over the course of two and a half years. The text is heavily footnoted. Unfortunately, his editor wasn't nearly so diligent. Mason put every bit of his research on the page, bogging down the narrative at nearly every turn. We get exhaustive rundowns on the career arcs of all the major players (and there are a lot of them), the highlights of every high-profile auction either company staged during the course of the conspiracy, every major deal the companies pulled off. Brooks and Davidge meet to conspire; Sotheby's or Christie's has a successful or less-than-successful auction; one house or the other lands a whale; then Brooks and Davidge meet again, in a cycle that lasts at least a hundred pages. Once the Feds get involved, we get the detailed blow-by-blow of the pre-trial maneuvering, then the play-by-play of the trial, which essentially rehashes what we learned during the pre-trial phase. What we don't get is much of an explanation of what happens in a major auction house below the executive-suite level. I'm interested in this material both personally and as an author playing in the same sandbox, and it took a serious act of will for me to get through the soggy middle of this book. If you're into schadenfreude, though, this book is for you. Al Taubman, the chairman of Sotheby's, rides to his minimum-security prison in a chauffeured limo. DeDe Brooks has to endure six months' house arrest in her $5 million Upper East Side co-op apartment. Chris Davidge throws a $1 million wedding while in exile in Mumbai. Both companies still exist today, carrying on much as they did before the conspiracy came together. The people who were allegedly hurt by the commission-rigging weren't laid-off blue-collar workers on the cusp of losing their homes, but among the wealthiest people in the world. The low-level employees sacked by the two companies in order to scrape together money for the fines and damages are dismissed with a single line, almost in passing, so we don't even get to sympathize with them. This is a detailed examination of the price-fixing scandal that rocked the art world a few years back. I read it long enough ago that the details are gone, but I remember enjoying both the inside look into an art world I knew nothing about and a fascination with the corporate crime story it tells. This read like fiction, but you couldn't make this scandal up if you tried. Bought this mostly for book research for my own novel, but you don't need an advanced interest in auction houses to enjoy it. 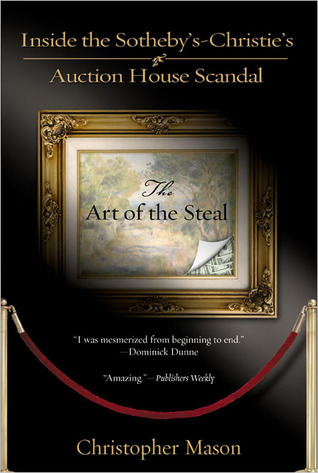 As opposed to "Priceless," which I did not like at all (and was a rare DNF), "The Art of the Steal" is a wonderfully written page-turner detailing the history, logistics and results of illegal price-fixing by the two largest auction houses in the world. Mason does a wonderful job of moving back and forth between the numerous people involved in the story, which could be tricky. It's a bit complicated, and various people were involved at different levels from two competing companies. 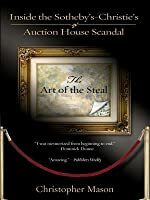 That said, it' As opposed to "Priceless," which I did not like at all (and was a rare DNF), "The Art of the Steal" is a wonderfully written page-turner detailing the history, logistics and results of illegal price-fixing by the two largest auction houses in the world. Mason does a wonderful job of moving back and forth between the numerous people involved in the story, which could be tricky. It's a bit complicated, and various people were involved at different levels from two competing companies. That said, it's never confusing - Mason explains every nuance while telling the true story in the manner of a top-notch drama, filled to the brim with art, money, intrigue, rumors and ultimately, disaster. Read the first half of book quite intently, then, got distracted. LOTS of details, and did find interesting, but book borrowed on ILL and wanted to get it back soon, so skimmed last one quarter of book. Subtitled “Inside the Sotheby’s-Christie’s Auction House Scandal”, Mason’s book introduced me an industry I knew very little about and a scandal I had never heard of. Introducing readers to multimillionaire tycoon Alfred Taubman, Dede Brooks ( the CEO of Sotheby’s and the first woman to ever hold the position) and Christopher Davidge (the British CEO of Christie’s) as well as a whole host of other characters, Mason lays out how the world’s most famous auction houses cheated their clients out of Subtitled “Inside the Sotheby’s-Christie’s Auction House Scandal”, Mason’s book introduced me an industry I knew very little about and a scandal I had never heard of. Introducing readers to multimillionaire tycoon Alfred Taubman, Dede Brooks ( the CEO of Sotheby’s and the first woman to ever hold the position) and Christopher Davidge (the British CEO of Christie’s) as well as a whole host of other characters, Mason lays out how the world’s most famous auction houses cheated their clients out of millions with a price-fixing scheme. Except I’m still not sure how exactly these two auction houses went about it; something about sliding commission scales not up for negotiation. It was clear to me from Mason’s book that the two CEOs were in collusion illegally. I just wasn’t sure exactly how the scheme was being carried out. It might had helped if I had noticed the charts at the back of the book at the beginning but, ultimately, there needed to be a stronger and clearer explanation of how commissions and pricing and percentages were defrauding buyers and sellers. The severity of antitrust legislation in the United States is something I remember being drilled into my head in every U.S. history course I took in junior high and high school. Certainly these laws have been covered in my college economics courses! So I thought it was interested that Chairmen and Chief Executive Officers of major, multinational corporations would have (or claim to have) no knowledge of these laws. That just seems so idiotic! - from the American Anti-Trust Institute Website: "...the real-life, criminal story of Sotheby's and Christie's, who (combined) controlled over 90% of all masterpiece sales in the world. Rather than compete head-to-head, in the mid-1980's, the Chairman and C.E.O. of one of the houses chose, instead, to meet, collude, and raise the commission rates of what both buyers and sellers pay to trade in Picassos, Monets, and Manets. Secret meetings took place in New York and London where higher rates were planned, implemented, and maintained." Absolutely loved this book. I was captivated by the whole story, from start to finish. While I don't know anything about the art world, it was interesting to get a feel for how it works. It seemed apparent the price-fixing was not at all necessary, given the close competition between Sotheby's and Christie's; a point made throughout the story. As with most industries, when one company moves to be more aggressive or to raise its prices, generally the closest competitor(s) will follow suit. I woul Absolutely loved this book. I was captivated by the whole story, from start to finish. While I don't know anything about the art world, it was interesting to get a feel for how it works. It seemed apparent the price-fixing was not at all necessary, given the close competition between Sotheby's and Christie's; a point made throughout the story. As with most industries, when one company moves to be more aggressive or to raise its prices, generally the closest competitor(s) will follow suit. I would have liked to have read more about Mr. Taubman's time in prison, though that part of the story was not the focal point of this book. I chose to read this book after reading Mr. Taubman's autobiography, "Threshold Resistance: The Extraordinary Career of a Luxury Retailing Pioneer". In his book, he spoke favorably of this book, as well as of its author, Christopher Mason. In Mr. Taubman's book, along with part of this book, Mr. Taubman detailed some of his time in a positive light, listing friends he made and his thoughts on the prison system. Recommends it for: an insomniac. All right, I'll admit it, I quit this book about 100 pages in. I enjoyed it, it was fascinatingly detailed, but not exactly the page-turning type of details. More like the intricasies of conversations and monetary figures and such. I'm sure the story is interesting, and the general theme seemed quite engaging, but it was a little to technical for me, and I'm involved in the art business. I can't imagine what it would be like for someone who had little interest in the art field! I took a break from fiction to read this after reading "An Object of Beauty" by Steve Martin. This took some time to get through, but was still fascinating in the way "The Informant" was fascinating. I really enjoyed it, even though I would have liked to see pictures of some of the art pieces which were mentioned. That might have upped the entertainment value. there are very few good books about these two auction house. i read it more for the inside info provided than interest in "the scandal"
The beginning was bogged down a bit by having to give a full biography of the 4 central owners and Ceo's involved, bit after that the pacing and storytelling were very engaging. I wish the author had more books. This book chronicles the white-collar crime story of the price-fixing scandal at Sotheby's and Christie's. Well-researched and well-written...great character studies of the major key players. I was slightly overwhelmed by the sophisticated vocabulary and my need to google every single art work mentioned in the book. I read this book because it was about my work. It was interesting and gave some information about the "scandal" that I didn't know. But it was clear the author was trying to sensationalize the subject and it affected the writing. This very newsworthy scandal was somewhat buried with all the goings on in September 2001. "The Art of the Steal" timelined events nicely; gave background information on people, places, and events referenced in it. Well-researched and interesting facts noted. I would recommend. i worked for christie's during the time this plot was uncovered and through the trials of davidge and taubman. thus, i was naturally interested in the book, but was disappointed. perhaps that is as it should be. Very interesting insight into the price fixing scandal between Christie's and Sotheby's. The last few chapters of this book were bogged down with minute detail that did not appeal to me however. I heard the movie was fantastic! Very informative while also very readable. The best thing about this book is it gives good insight on how and why the auction houses transformed themselves in the 1980's to what they have become today. Plus lots of details on how the events unfolded over the course of almost ten years. A very well told story about the Christies-Sotheby's price fixing scandal. The sheer greed and hubris of the main players in the scheme is astounding, yet after other relatively recent scandals like Enron and Andersen, painfully not surprising. Very interesting character study of people in leadership (?) positions and how the greed, drive and different cultures mesh to create chaos. I learned that the most guilty are not always those who suffer most and often the adgendas of the legal profession have the greatest affect. As an antiques dealer myself it was very heartening to read someone lifting the lid on the rottenness of the London auction business. Unfortunately no one seemed to take much notice and Sothebys and Christies carry on much as before. A fun chatty history. Enjoyable read. Easy to read retelling of the Southeby's & Christie's auction houses price fixing scandal. Disclaimer: I have a weakness for stories of corporate fraud.